2) I was directly involved. Not in the planning, but as an official timekeeper, along with Pelicus Miratus Velocitas, tasked with, well, keeping the official time. Let me say right up front that I was skeptical. I had publicly expressed doubts in these pages as to the preparation work and fitness of USA Rugby to manage such an event. I had privately expressed quite a bit more using language my mother would not be proud of as I foresaw disaster looming. After all, USA Rugby has not proven that they could manage our national events, much less international events. Some early decisions I felt were extremely ill advised, starting with not allowing United World Sports, the entity that runs the very successful USA Sevens in Las Vegas, to have anything to do with the planning and organizing of the event. 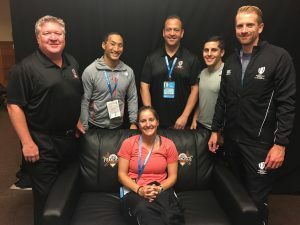 USA Rugby essentially said “We got it – no need to help us” to the only domestic entity with a proven track record of putting on a major international 7s rugby tournament. That seemed foolish and petulant to me. This lack of experience became apparent as expenses were badly miscalculated when USA Rugby decided to put all the teams and officials in the Grand Hyatt in downtown San Francisco, a not inexpensive location to host 40 teams, plus coaches and staff, plus trainers for over 2 weeks. Then you add in the referees, both international and domestic, plus various World Rugby officials and USA Rugby officials and you have a substantial bill at the end. This isn’t taking into account transportation, food, training facilities and field rentals, stadium rental and all of the other little things that are expected of the host country. The upshot of all of this is that I don’t see how USA Rugby could turn a profit (remember, this was sold as a $5million bombshell for us). In fact, it would take a miracle to break even. I have been a part of large tournaments before, notably running the world famous Santa Barbara International Rugby Tournament in 1992 and 1993, so I know that once a tournament starts it has its own momentum. Even more so when international teams, television broadcasts and massive ticket sales are involved. This was a WORLD CUP, so it was going to happen no matter what, hell or high water, damn the torpedoes, with cream and sugar please, all aboard the love train doing the loco-motion. World Rugby would not allow it to fail. And it most certainly did not fail. The stands were brimming with fans from across the world, well over 100,000 over the three days (final totals have not been announced as of this writing). It certainly passed the eye test as the stands were full even accounting for all of the people walking around the stadium at any given time. The field looked good and held up well – I didn’t notice any excess loss of footing even on the newly placed infield turf. Everyone had a great time and, as per usual at international events, the stadium staff and police were amazed at how friendly and well behaved everyone was even when playing rivals or after a loss. Welcome to rugby culture, folks. I have to give credit where credit is due. 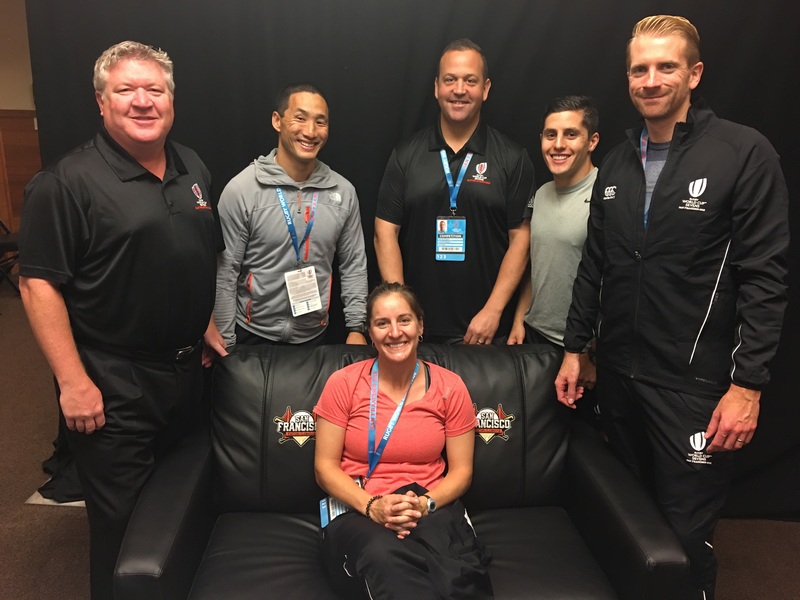 From all appearances, the tournament went off without a hitch and is a massive feather in the cap of USA Rugby. It showed the world that the US can not only compete on the world stage (we already knew that) but could support a World Cup in record breaking numbers. If there were any hiccups on the weekend they were not noticeable and everyone involved should pat themselves on the back for a job well done. Even the Weather Priestess kicked in with the 3 most perfectly gorgeous days San Francisco has seen in years. You seriously could not have had better rugby weather: just warm enough to encourage shorts and shirts without being too hot and clear blue skies well into the evening darkness with Karl The Fog holding off until matches were complete. We have yet to see the final numbers and if USA rugby made money (unlikely), lost money (a tragedy for a Union that is broke), or broke even (highly likely, from all appearances). Unfortunately, World Rugby and AT&T Park get paid first and USA Rugby only gets paid from what is left, but even with a modest financial loss this tournament has to be considered a rousing success. The only black mark I can think of is the size of the pitch (the numbers I heard were 94m in length and 60m in width with 5m in-goals areas), so it was a little short and a little narrow – not ideal for a World Cup. This was, of course, known coming in as it is impossible to fit a full sized rugby pitch in AT&T Park without some major renovation. The good news is that the casual fan and 90% of the non-casual fans probably didn’t notice. You had to be looking for something like that. Even the format, the single elimination required to fit 2 major events on one field at the same time was barely noticeable and didn’t provide the massive upsets that people were afraid of. After all, one bad game each and both the USA men and women could have been out of the running by Friday evening. Still not ideal for a 7s tournament, but it worked. So take a bow USA Rugby and everyone else involved in putting on a world class event. I had my doubts and you proved me wrong. This should be the first step towards hosting the 15s World Cup. The USA women started off with a rout of an overmatched China 38-7 and followed that up with a deceptively close win of 33-17 over Russia. I say deceptively close because Russia scored 2 tries while America had a player in the sin bin to bring the score to 22-17 before the US pulled away with al 7 on the pitch. And then came the juggernaut that is New Zealand. The USA gave them all that they could handle and the Kiwis escaped, yes escaped, with a narrow 26-21 victory. Let us put that in perspective. The Black Ferns did not allow a point to anyone else, including France in the final. The scoreline against the US was 26-21. The scoreline against everyone else was 105-0 and that includes the World Cup Final. Yes, we lost to Australia in the consolation game but Americans never seem to get up for consolation games. Even with the 24-14 loss to Oz we could put our hand up to being the 2nd best team in the world. Not too shabby. You done us proud, ladies. The men had a similar track. Given a first round BYE via their status as a top 8 team in the latest World Rankings, they drew, as expected Wales. This was not an easy match by any stretch of the imagination as Wales had beaten us several times recently and the match was the last one played on Friday, at 9:30PM. So imagine having to sit around all day with all your nervous energy and nothing to do with it, listening to the roar of the crowd and watching the excitement of all the other matches and then having to go out and perform. At least Wales had an opening round match to knock the cobwebs off. So did Mike Friday have the lads ready? And how! A 35-0 thrashing showed our class as the fans stuck around until the end to cheer the home team on. Next up was a quarterfinal against England. A fantastic, back and forth match with Perry Baker and Dan Norton matched up head to head to see who was the better finisher. That matchup turned out to be a draw as each scored a try. In fact, the entire match turned out to be a draw as both sides played great back and forth rugby but ended up tied at 19 at the end of regulation. Then, in a move that probably only 5 people in the world could have pulled off, England scored the golden points on an inch-perfect, 40 meter cross field kick. Any further upfield and Burgess doesn’t catch the ball and it bounces into touch. Any further back and Burgess has to slow down to catch it and Madison Hughes catches him before he can score. But no, it was perfect, and 40,000 hearts were broken. The US men rebounded strongly against Scotland with a convincing 28-0 victory, but looked flat and disinterested in the 5th/6th playoff against Argentina. The scoreline was 33-7 and could have been worse, as we scored our only points with time expiring. I said it earlier in this column, America doesn’t do consolation games well. Once we are out of a Cup competition we seem to lose focus. In any case, that ended the day for the locals who can hold their heads high for the effort, only losing to the eventual runners up via a miracle kick. The USA Women’s team finished 4th, with losses to champions New Zealand and Series winners Australia. They could argue that they are, in fact, the 3rd best team in the world and even the 2nd best, seeing as they were the only team to really push the Kiwis. Considering that they lost their best player (Alev Kelter) a week before the tournament and then lost her replacement (Kelsey Stockert) 2 hours before their first game. These are significant losses, especially considering Alev Kelter would give Portia Woodman a run for Best Player In The World. They must be disappointed to finish out of the medals, but should be immenely proud of how they played. A random comment from a friend of mine after seeing one of the many Facebook posts about rugby: “I just watched some of the rugby on TV. I didn’t know ladies played!” Yes, I replied, they do. And they are certainly ladies, I added. The care our ladies took to meet fans, work with the community and generally comport themselves was above reproach. Not just us, but all of the ladies from all the teams. Gods, but I love rugby. We may be seeing the final laps for the “Core Four” of Perry Baker, Danny Barrett, Martin Iosefo , Maka Unufe and Folau Niua. Ok, that’s 5 players but “Core Four” sounds better than “Jive Five”. Baker and Niua are in their 30s. The other three are 28. They are starting to see the end of their careers as 7s is a young man’s game. They aren’t paid enough to do this forever (note: I don’t know if the women are paid at all) and will soon move on to the next stage of their lives. This is certainly the last 7s world cup we will see them all at and they can look back on their accomplishments with great pride –they changed the game domestically by raising expectations and internationally by forcing teams to change tactics and focus. You see, the rest of the world has caught up to our boys. 7s players have always been fast but you now see most teams will have a flat out speedster that can challenge Baker and sometimes even contain him. More importantly, the rest of the world has figured out our kickoffs. The greatest evolution the USA underwent under Mike Friday was the importance he put on restarts. Previously we would be guaranteed to mess up a kickoff and gift possession to our opposition and the better teams crucified us for it. You can not give good teams extra possessions because that leads to extra scores and losses. We became a dominant force at restarts and lapped the rest of the world with our retention percentage… until the World Cup. Teams have adjusted and we not only failed to retain our kickoffs but also failed to retain the kicks that we were receiving. This was a huge advantage that we no longer had and it showed. Looks like Mr Friday has some work to do to address this lack of imbalance to tip the scales back into our favor. It isn’t just the women who were class acts, but the men as well. One of the great things about rugby is the general humility and ethos of rugby players, past and present. No other sport has this culture where the superstars and international legends so freely mix with the common fan. This has become exemplified in the concept of “sweeping the shed”. 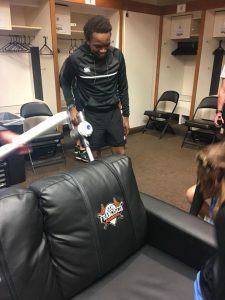 You are responsible for your surroundings and, traditionally, the captain of a side is the last one out of the locker room to make sure that no mess is left behind. 30 minutes before this photo was taken Fhatuwani “Rasta” Rasivhenge was refereeing the World Cup Final. Now he is literally sweeping the shed because, and I quote, “you never leave a messy locker room behind”. Every other referee joined in without being asked. This is yet another reason why I love rugby so much. While all this was going on we were still playing 7s back here in Pelicanland. The national qualifier series were a series of tightly contested games with very few blowouts on the men’s side. (Unfortunately, I do not have information on the women at this time.) The end result was Olympic Club, Life West and Official Surprise Team Sacramento Capitols going up to PNW to vie for nationals. And they all lost. Granted Life West lost in the final, but they lost. Why do I mention this so harshly? Because for the first time ever, Northern California does not have any representative at nationals. This is a fact that shook me to my core. Back in my day (insert grainy footage here, complete with Morgan Freeman voiceover… “on these hallowed fields, short shorts, baggy jerseys, windswept mullets and all, rugby was played, not just for fun, but for glory”) we regularly sent 3 teams to nationals, at the very least 2. Old Blues and San Mateo each won a few titles and we were always in the semis and finals – often with more than one side in these final matches. Northern California boasts a quarter of the current USA squad and yet we can not get a team to nationals. This is not a one time fluke but the culmination of an ongoing trend as the NCRFU underperformed and gradually had seeds stripped away until now, when we have to go through the Seattle sides, stocked with pro players and Waisale Serevi’s influence. A tall order, indeed, and too tall this year, but in the past we would have eagerly accepted the challenge. So now I throw the gauntlet down. To all NCRFU clubs who care about 7s, I challenge you. Take back what is rightly ours. Life West, SFGG, San Jose, O Club, Sacramento, Santa Rosa, you may think you train hard but it isn’t hard enough. Everyone else, this is your chance to do something special. Push yourself. Dedicate yourself. Southern California will be sending 3 teams to nationals while we have none – this is intolerable. Focus. Start training earlier. Play more tournaments. Commit. Travel outside our region to get better competition. In the past we didn’t need to do that because the best was right here. Not so any more. The purest form of rugby must come home or there will be a wailing and a gnashing of teeth and other indecent carrying-on. And after all of this work, next summer, go do that voodoo that you do sooooooooo well! Pelican representatives at the Rugby World Cup 2018, San Francisco. Standing L-R: James Hinkin, Tim Lew, Preston Gordon, Steven Fenaroli, Phil Akroyd. Sitting: Lee Bryant. James Hinkin and Preston Gordon acted as timekeepers. Tim Lew, Steven Fenaroli, Phil Akroyd and Lee Bryant acted as In Goal Judges and Assistant Referees. This entry was posted in News on August 3, 2018 by James Hinkin.